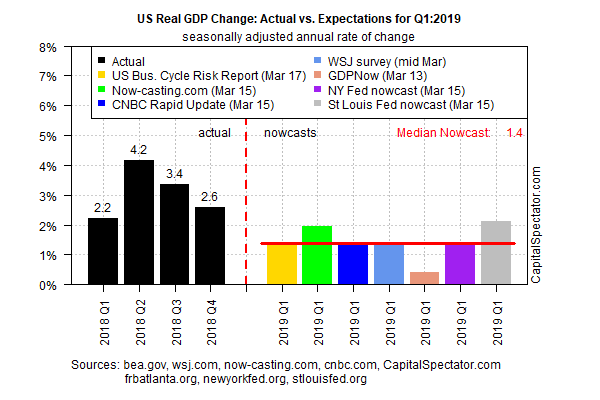 The recent slowdown in US economic growth is expected to continue in the first quarter, according to the latest nowcasts for GDP. The estimates will likely be a factor in the Federal Reserve's policy meeting. Although US economic momentum has decelerated, the probability remains low that an NBER-defined recession will start in the immediate future. The recent slowdown in US economic growth is expected to continue in the first quarter, according to the latest nowcasts for GDP. The estimates will likely be a factor in the Federal Reserve's policy meeting that begins today and concludes tomorrow with an announcement on interest rates, a new set of quarterly forecasts and a press conference. Meantime, next month's initial release of Q1 GDP data by the Bureau of Economic Analysis is expected to show that output decelerated for a third straight quarter, based on a set of estimates compiled by The Capital Spectator. The median nowcast for this year's first three months is a sluggish 1.4% increase (seasonally adjusted annual rate), unchanged from the previous estimate in early March. Considering the subdued outlook for Q1 growth, it's no surprise that economists are expecting that the Fed will leave interest rates unchanged in tomorrow's policy announcement (Mar. 20). Econoday.com's consensus forecast calls for the central bank's target rate to hold steady at a 2.25%-to-2.50% range. One headwind is the ongoing US-China trade war, which has trimmed US GDP by a fractional 0.04%, according to a new study by the National Bureau of Economic Research. Another estimate of the trade war's blowback finds that "GDP growth will remain on an upward trajectory, albeit negatively impacted by as much as -0.2% on a year-on-year basis over the next two years," via IHS Markit research. Monitoring the GDP trend on a year-over-year basis suggests that economic activity peaked in last year's Q4. The Capital Spectator's average estimate via a set of combination forecasts indicates that the point forecast for this year's annual first-quarter increase will tick down slightly to a 3.0% pace from 3.1% in Q4 and continue to soften in the quarters ahead. 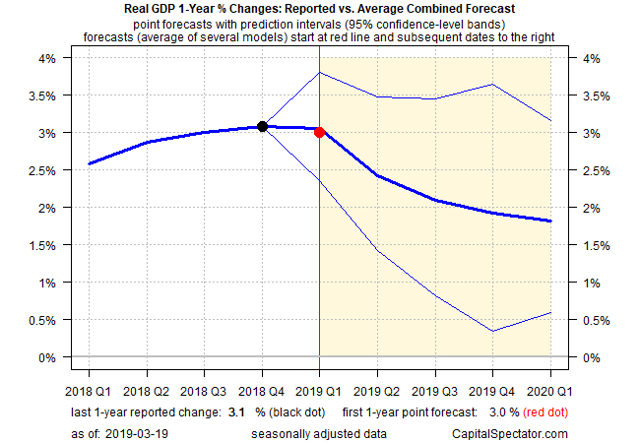 Although US economic momentum has decelerated, the probability remains low that an NBER-defined recession will start in the immediate future, based on a pair of business-cycle benchmarks created by The Capital Spectator. Using these indexes as a guide also suggests that the macro trend's recent slowdown is stabilizing, at least through April. Looking further ahead necessarily suffers from greater uncertainty. A key variable for revising the outlook, or not, is learning if the sharp slowdown in the growth of payrolls in February was noise or an early warning of deeper troubles ahead. For now, the numbers offer a cautiously optimistic basis for expecting that the recent slowdown in growth will stabilize in the months ahead. This Friday's update (Mar. 22) of the US Composite PMI for March is expected to support that forecast. Econoday.com's consensus forecast sees the index ticking down to a moderately firm 55.2 in March. Although that's fractionally below February's 55.8, both readings are comfortably above the neutral 50 mark that separates growth from contraction and point to a more or less steady trend for Q1.